The solar powered airplane of Bertrand Piccard and André Borschberg will stay in Hawaii until early spring 2016, despite early efforts to repair the batteries which overheated in the record breaking oceanic flight from Nagoya to Hawaii. 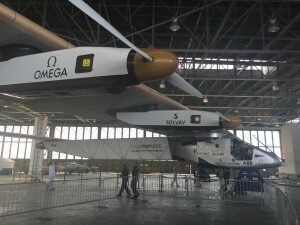 Following the longest and most difficult leg of the round-the-world journey — which lasted five days and five nights (117 hours and 52 minutes) — Solar Impulse will undergo maintenance repairs on the batteries due to damages brought about by overheating. The University of Hawaii with the support of the Department of Transportation will host the airplane in its hangar at Kalaeloa airport. Post maintenance check flights will start in 2016 to test the new battery heating and cooling systems. The round-the-world mission will resume early April from Hawaii to the USA West Coast. From there Solar Impulse will cross the USA to JFK in New York before making the Atlantic crossing to Europe and then returning the point of departure in Abu Dhabi. Swiss pi oneers Bertrand Piccard (Chairman) and André Borschberg (CEO) are the founders, pilots and driving force behind Solar Impulse, the first aircraft able to fly day and night without a drop of fuel – propelled solely by the sun’s energy. 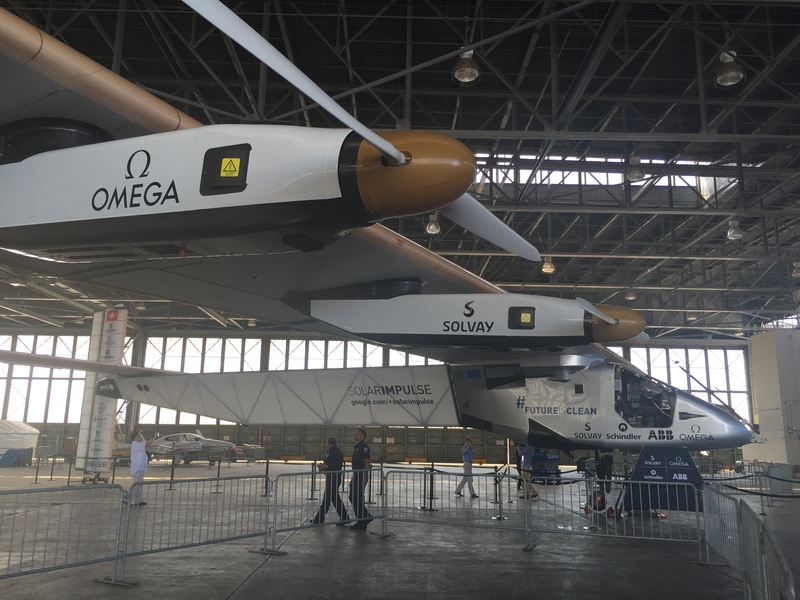 With the Si2 aircraft, they are attempting the first Round-The-World Solar Flight in 2015. Supported by Main Partners Solvay, Omega, Schindler, ABB, and Official Partners Google, Altran, Bayer MaterialScience, Swiss Re Corporate Solutions, Swisscom and Moët Hennessy, this historic first aims at demonstrating that clean technologies can achieve the impossible. After the original Solar Impulse Si1 prototype which holds 8 world records, Si2 engineers have designed and constructed a new single-seater aircraft made of carbon fiber. It has a 72 meter wingspan (larger than that of the Boeing 747) for a weight of just 2,300 kg, equivalent to that of a car. The 17,248 solar cells built into the wing supply electric motors (17.5 CV each) with renewable energy. The solar cells recharge four lithium polymer batteries totaling 633 kg each, which allow the aircraft to fly at night. 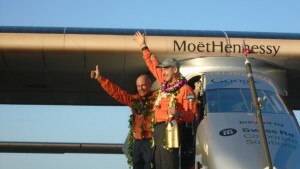 This unlimited autonomy has been proven on July 3rd, 2015, when Si2 landed in Hawaii after flying 5 nights and days without fuel from Japan, breaking the world records of distance and duration for solar aviation, as well as the world record for the longest solo flight ever, (117 hours and 52 minutes – around 7,200 km. These world records are currently under ratification by the International Aeronautical Federation.